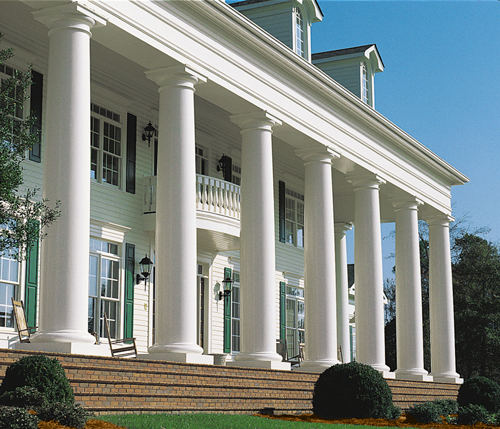 Our popular DuraClassic™ composite fiberglass columns are cast entirely in our impact resistant fire rated fiberglass reinforced polyester resin marble composite and are available both load bearing or as column covers. We offer them to you in a broad selection of beautiful classical or contemporary designs in round or square shaft styles.If your project calls for fiberglass columns that are 6″ to 12″ in diameter, DuraClassic™ composite fiberglass columns are the most affordable and easiest to install fiberglass columns on the market. They are also available in larger diameters from 14″ to 36″ and heights to 24′ at affordable prices, as well. Our limited lifetime warranty and durable impact resistant poly/marble composite capitals and bases and column shafts make DuraClassic™ fiberglass columns the column of choice of architects and contractors across the country for high wear applications like government housing, apartments and school applications, yet they are equally suited to enhance the beauty of the front porch of your home. Our ClassicGlas™ fiberglass columns are cast from our FiberResin fiberglass composite which is impact resistant, and they are engineered to reduce weight for use on projects where your design calls for larger fiberglass columns. We offer you a wide array of authentic classical and contemporary designs, in round or square shaft styles from which to choose. 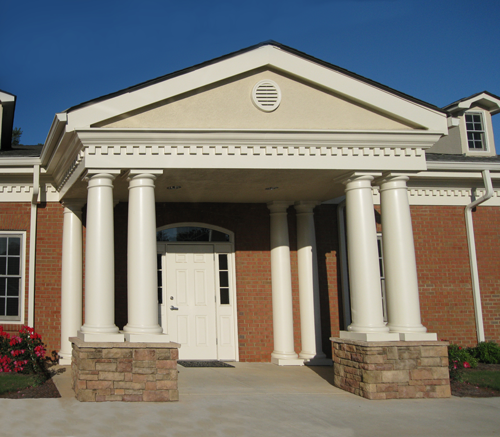 We can also provide you with custom fiberglass columns at affordable prices.ClassicGlas columns are offered with smooth, or fluted shafts in diameters from 14″ to 36. With fluted ClassicGlas fiberglass columns, the flutes are correctly stopped at your desired height above the column base regardless of column height. Simple to install ClassicGlas™ fiberglass columns are designed to be load bearing, however, they are also simple to install when provided as column covers. Their reduced weight and overlapping full length alignment tabs lower installation costs, reduce installation time, and give you a beautiful monolithic appearance.